Last week a Philadelphia appellate court announced (after months of silence) that it would not revisit the conviction of animal rights activists on terrorism charges. 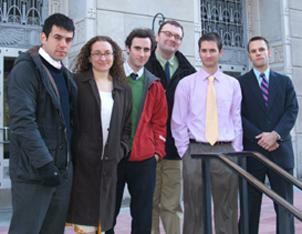 The SHAC 7 were convicted of conspiring to commit animal enterprise terrorism by running a controversial website that posted news of both legal and illegal actions, along with personal information of people connected to the notorious animal testing lab Huntingdon Life Sciences. Their campaign had brought the multinational corporation near bankruptcy. A three-judge panel of the court had previously upheld the conviction, and the defendants had asked that the full court review it. Now, the only option is to request that the Supreme Court of the United States review the case. There has been no official word about this yet, but multiple defendants have expressed their interest and having this landmark First Amendment case heard by the Supreme Court. Meanwhile, the lead prosecutor who helped secure this “victory in the War on Terrorism” has– surprise, surprise– been promoted. Charles McKenna is now the head of the New Jersey Office of Homeland Security and Preparedness. He was quoted a few days ago about his hopes for using new “anti-terrorism technology” in his new job. “We are particularly interested in computer profiling, which is much more sophisticated, and quicker, than traditional racial profiling,” he said. The targets of this new profiling technology? As you can see in this photo, the SHAC 7 are quite gangsta. But no reasonable person could argue that they are the “same” as violent street gangs and Islamic terrorists. Such absurd scare-mongering rhetoric has become normal for corporations, industry groups, and the politicians who represent them. When it is adopted by government officials who are in charge of keeping us safe, though, it has frightening implications. There are limited anti-terrorism and law enforcement resources. When people like McKenna let shameless political opportunism shape security priorities (and make no mistake, this is nothing but political opportunism–he has already been rewarded for defending the “system” from activists), it puts everyone at risk.